Tax Reform – What Does it Mean for You and Your Business? - Ward and Smith, P.A. Tax Reform – What Does it Mean for You and Your Business? Let's face it—the Internal Revenue code (the "Code") and the reams of regulations that implement the Code can be very complex. 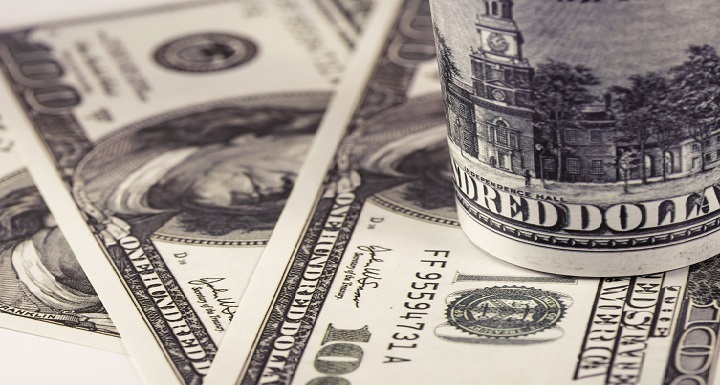 However, most individuals and business owners want to take advantage of every tax maneuver they can to minimize the amount of taxes they pay to the federal government. Against this backdrop, the President and the United States Congress have been working for most of 2017 to implement a tax reform package with the goal of simplifying the Code. While reasonable minds can disagree on whether it actually simplifies the Code, Congress passed its tax reform package (called the "Tax Cuts and Jobs Act") on Wednesday, December 20, and the President signed the tax reform package into law on Friday, December 22, with most of the provisions set to take effect on January 1, 2018. Thus, the changes made in the law will, for the most part, not have an impact on taxes due for the 2017 tax year. This article provides an overview of the key changes to the income tax provisions that impact individuals and businesses, as well as the key changes to the estate and gift tax provisions. 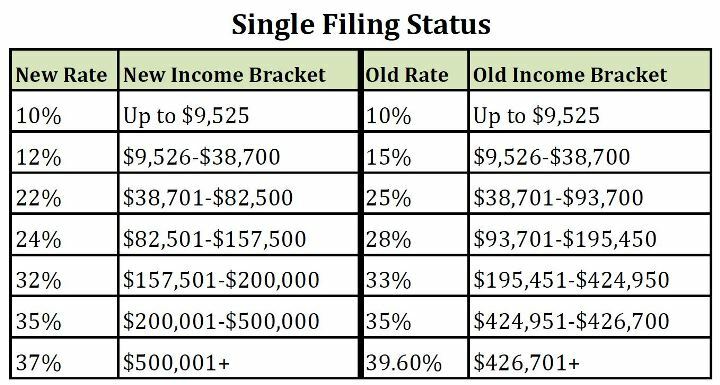 Starting on January 1, 2018, the individual income tax brackets will change as illustrated in the charts below. 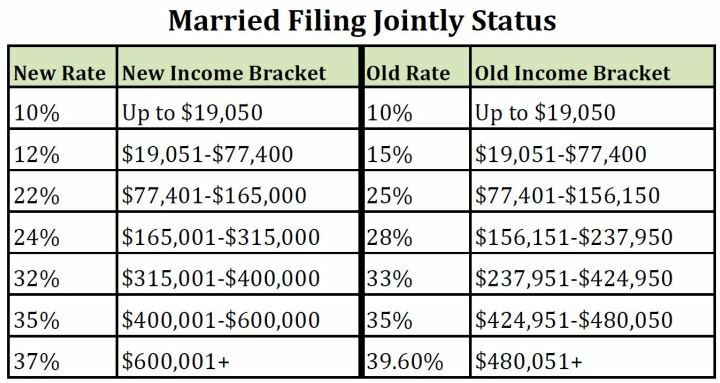 As you can see, the top marginal tax rate for individuals will be reduced from 39.6% to 37% and there are significant changes to the tax bracket structure. The tax reform package increases the standard deduction amount to $12,000 for single filers (previously $6,500) and $24,000 for joint filers (previously $13,000). The tax reform package eliminates the personal exemption and reduces the number of itemized deductions taxpayers can take. For example, the deduction for alimony payments will be eliminated for divorce or separation instruments entered into on and after January 1, 2019. Mortgage Interest Deduction – The mortgage interest deduction is retained, but the principal amount on which the mortgage interest deduction can be claimed will be reduced from $1,000,000 to $750,000 for single taxpayers or married taxpayers filing jointly; $375,000 for married taxpayers filing separately. State and Local Tax Deduction – The deduction for state and local income taxes, property taxes, and sales taxes is retained, but it is capped at $10,000. Of important note is that the tax reform legislation expressly prohibits taxpayers from pre-paying 2018 state and local taxes in 2017. Medical Expense Deduction – The medical expense deduction is retained, and the medical expense deduction threshold will be reduced from 10% of the taxpayer's adjusted gross income ("AGI") to 7.5% of the taxpayer's AGI. The child tax credit will be increased from $1,000 per child to $2,000 per child, with the income level at which the child tax credit begins to phase-out being increased from $110,000 to $400,000. The exemption amount for the alternative minimum tax ("AMT") will be raised to $70,300 for single filers and $109,400 for joint filers, with the AMT phase-out threshold increasing to $500,000 for single filers and $1,000,000 for joint filers. The tax reform package significantly changes the corporate tax rates that apply to C corporations, moving from a multi-bracket structure with a top marginal corporate tax rate of 35% to a single-bracket structure with a flat corporate tax rate of 21%. The tax reform package creates a new deduction for owners of pass-through entities (i.e., Subchapter S corporations, limited liability companies taxed as partnerships, and partnerships). In general, a taxpayer may deduct up to 20% of qualified business income earned through a pass-through entity. The deduction is subject to a series of complicated limitations based on the wages and capital of the pass-through entity. Owners of certain professional service businesses, such as doctors, lawyers, and accountants, are subject to a phase-out of the pass-through deduction with respect to their professional service businesses which begins for single filers with AGI of $157,500 and joint filers with AGI of $315,000, with the pass-through deduction being completely phased out at for single filers with AGI of $207,500 and joint filers with AGI of $415,000. Note that this limitation only limits the taxpayer's ability to utilize the new pass-through deduction with respect to income from the professional service business, so the taxpayer may be able to take a pass-through deduction with respect to other pass-through entities in which the taxpayer has an ownership interest. Bonus Depreciation – For tax years 2018-2022, the tax reform package will allow businesses to take immediate 100% bonus depreciation (increased from the current 50% bonus depreciation limit) with respect to certain short-lived assets, such as machinery and equipment. Section 179 Expensing – The tax reform legislation allows Section 179 expensing with a cap of $1,000,000 and a phase-out beginning at $2,500,000 of eligible property purchased during the subject tax year. For tax years 2018-2022, businesses will be able to deduct business interest up to a limit of 30% of the business's earnings before interest, taxes, depreciation, and amortization ("EBITDA"). For tax years after 2022, the limit changes to 30% of the business's earnings before interest and taxes ("EBIT"). Businesses with average gross revenues of $25,000,000 or less over the prior three years are excluded from the limit and can fully deduct their interest expenses. Certain industries, such as the farming industry and the real estate industry, are excluded from the limits and can fully deduct their interest expenses if they meet certain conditions. Taxpayers will be able to carry forward any business interest that is not deductible in the subject tax year due to the application of these caps. The tax reform package allows taxpayers with average gross revenues of $25,000,000 or less over the prior three years to use the cash method of accounting. The tax reform legislation eliminates the ability to engage in Section 1031 like-kind exchanges for items of personal property (such as vehicles, airplanes, and equipment) or intangible property, but preserves the ability to engage in Section 1031 like-kind exchanges for real property. The unified estate and gift tax exemption amount will be doubled to approximately $11,000,000 per person, which will be indexed based on inflation. Currently, an individual may convert a pre-tax IRA contribution to a post-tax Roth IRA by paying tax on the income converted to Roth IRA status. That individual also may unwind the conversion on or before the due date of the tax return filed for the year of conversion. The right to undo the conversion is most often exercised by taxpayers who convert from a traditional to a Roth IRA only to see the assets decline significantly in value. The tax reform legislation eliminates the ability of taxpayers to unwind conversions to a Roth IRA, effective as of January 1, 2018. The tax reform legislation does not affect to any great degree rules applicable to tax-qualified retirement plans or deferred compensation arrangements. Although several proposals regarding such plans were proposed as ways to increase revenues, they were eventually rejected. We hope that this overview of the key provisions of the recently enacted tax reform package is helpful as you begin to analyze what the tax reform package means for you and your business. Members of Ward and Smith's Tax Practice Group are experienced in helping individuals, business owners, and managers engage in tax planning to ensure that transactions are structured in the most tax efficient manner. The new tax reform package presents a number of new planning opportunities and over the coming months, our Tax Practice Group will provide additional commentary about these new planning opportunities. © 2019 Ward and Smith, P.A. For further information regarding the issues described above, please contact Lee C. Hodge or Steven B. Long.